Rabbits usually take well to litter training, although some flexibility may be required by the owner. Rabbits naturally pick one or more toilet areas, and owners can take advantage of this in litter training. First, a suitable litter is needed. Your rabbit will probably like to lay in the litter box and may even nibble on the litter, so something absorbent and safe is necessary. Rabbit urine also has a strong odor, so something that absorbs odor is ideal. Do not use clay or clumping litters, or cedar or pine wood shavings. Organic or paper-based pellets and litters are a good choice (brands include Critter Country, Eco-Straw Pellets, Gentle Touch, Cell-Sorb Plus and Yesterday's News - see Top Alternatives to Cedar and Pine Shavings for more options) Some owners simply use rabbit pellets as litter. These are economical and safe but are not a good choice if your rabbit continually eats extra pellets from the litter box and/or is overweight. For litter pans, cat litter boxes work pretty well, although smaller pans such as cake pans may work for smaller rabbits. If your rabbit tends to back right up to the edge and deposit outside the box, some creativity may be required. A covered cat box is a good option or a dishpan that has higher sides can work as well (a lower entry can be cut into one side). The larger size of corner litter boxes might work well for smaller rabbits too, as these usually have fairly high backs. If your rabbit tends to tip the pan or kick the litter out, try a heavier litter. To start, confinement and supervision is the key. If a rabbit is allowed to urinate and defecate wherever it likes from the beginning, it will be much harder to train. At first, keep your rabbit primarily in his (or her cage), which should be fairly small at first, with a litter pan. Place a litter box in the cage, and note where you rabbit eliminates. He (she) may start using the box or may pick another corner of the cage as a toilet. If this is the case, then move the litter box to the area your rabbit seems to prefer. Flexibility on litter box placement may be necessary both in and out of the cage. Once your rabbit is using the litter pan in the cage, allow the rabbit out of the cage in a limited area. Provide a litter box within this area, and perhaps make it enticing by placing a treat or favorite toy in the box. Watch your rabbit for signs he is about to urinate or defecate (they usually back up and lift their tail slightly), and try to herd him to the box immediately (if your rabbit is very calm about being picked up it should be okay to place him right in the box). If your rabbit uses the box, give the rabbit a treat (food, toy, petting, or praise) right away. If you notice your rabbit tends to head to one area to do its business, consider putting the box here. Accidents will happen, and punishment has no place in training a rabbit. Your rabbit will absolutely not be able to make a connection with physical punishment and eliminating outside the litter box. If you catch your rabbit in the act calmly and gently take him or her to the litter box immediately. But, if you don't physically catch your rabbit urinating or defecating, it is too late for your rabbit to make the connection. Just clean up and watch your rabbit a little more closely next time (clean the spot diluted vinegar, or a commercial pet stain/odor remover). The key is to get your rabbit to the box before he goes, so a trip to the litter box every 10 minutes during playtime can be helpful. Over time, your rabbit will probably develop a preference for using the box, and the amount of freedom you give your rabbit can be increased. You may need to provide more boxes as you allow your rabbit access to more space (rabbits may not go far in search of a box so have them handy). Again, if your rabbit repeatedly chooses one place in the room to eliminate, consider putting or moving a litter box there. Try to work with what your rabbit naturally wants to do, but if the location they "choose" is inconvenient, you can try putting a litter box there for a while and then gradually move it to a better spot. Sometimes, placing a bowl of food where you don't want them to go works too. 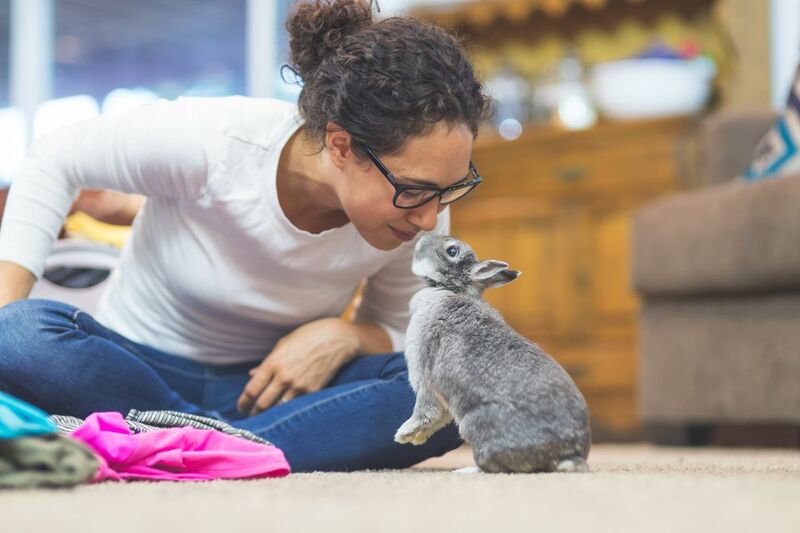 The process sounds daunting but usually goes pretty smoothly as long as the owner works with the rabbit's natural tendencies and provides undivided attention to the rabbit during its free time in the beginning. Establishing a routine with your rabbit will also help. Sometimes a previously trained rabbit will get a little careless, and this usually means backtracking and restricting freedom until your rabbit is trained again. Older rabbits are usually easier to train than young bunnies, as they do not need to eliminate as frequently and their natural desire for cleanliness is more developed. However, once rabbits hit puberty the desire to mark territory becomes very strong, and even previously well-trained rabbits may start urine marking and spraying as well as defecating to mark its territory. Marking behavior will often result from a variety of stresses along with the natural instinct to stake out a territory. Urine marking does not always take the form of spraying, and both males and females mark, although it is far more common with intact males (not neutered). Sometimes territorial marking is a temporary situation and may occur in response to some sort of stress, change in routine, change in the household, or addition of another pet (particularly another rabbit). Often, once the rabbit no longer feels stressed or is confident his territory is secure, he (or she) will stop marking. With all that said, rabbits are prone to health problems with their urinary tract, so if there is a sudden persistent change in urination habits or the color and amount of urine, a trip to a veterinarian is in order. This is especially true if your rabbit starts urinating small amounts frequently (most rabbits urinate infrequently and in large volumes). Have your rabbit spayed or neutered by 4-6 months of age. This has many health benefits for your rabbit, and will also make litter training easier and reduce urine spraying and other marking behaviors. Getting the surgery done at a young age works best - once marking becomes an established behavior, it may be very difficult to litter train the rabbit. Make sure the rabbit feels secure in its home. Try to avoid reaching into the cage and pulling a rabbit out as this may make the rabbit feel threatened and more likely to mark, and do cage maintenance (cleaning the cage etc.) while the rabbit is out of the cage.